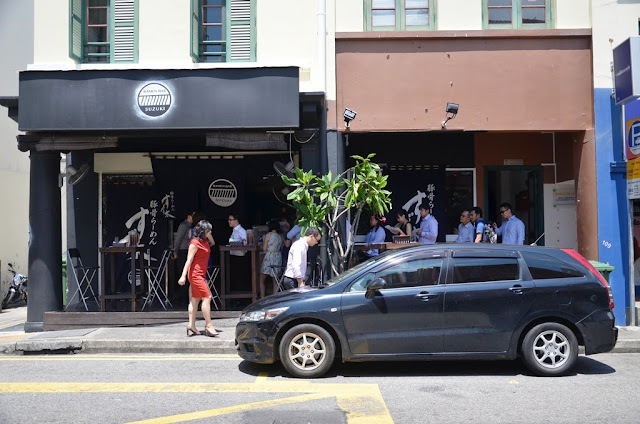 [SG] Ramen Bar Suzuki - The search for best ramen in Singapore continues! Having returned to Singapore, I learnt from my colleagues that we have a similar ramen craze like that in Hong Kong. With my last bowl of calories worthy ramen from Ichiran, I had since been struggling to find the next best challenger. 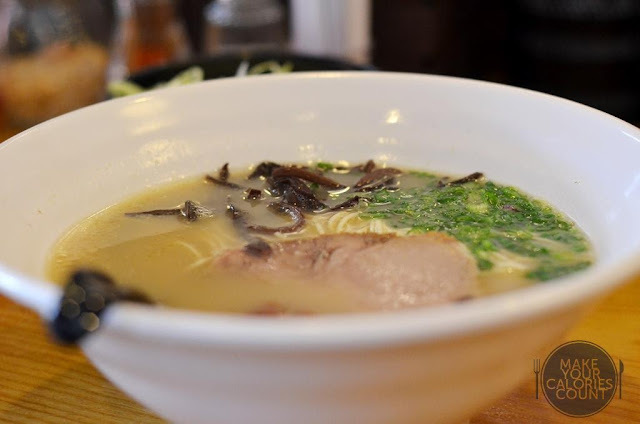 Receiving strong recommendations from several colleagues, we thought that Ramen Bar Suzuki would be a close contender. Can they survive the ramen test? Arriving just after 12pm, a queue was already in sight. 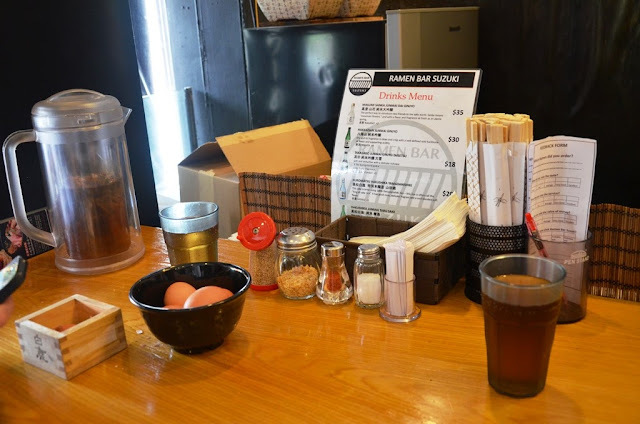 It seemed like the customers who obediently formed the queue are regular patrons since they were busy scribbling their choice of ramen and toppings on the order chit located at the front of the restaurant. Unlike Ichiran which only served one type of Tonkotsu ramen with choice over the types of toppings, the menu here had a wider range of offerings. There was the Pure White Tonkotsu Ramen (S$12.90/-), Jet Black Pig Bone Ramen (S$13.90/-), Spicy Tonkotsu Ramen (S$15.90/-) and various others. The choice of toppings were similar ranging from flavoured boiled egg (S$1.50/-), black fungus (S$1/-), Yaki Nori Seaweed (S$1/-) to having extra protein with pork belly char siew (S$3/-). For the full menu, please click here. We took our seats at the counter as they conveniently became available when our turn was up. 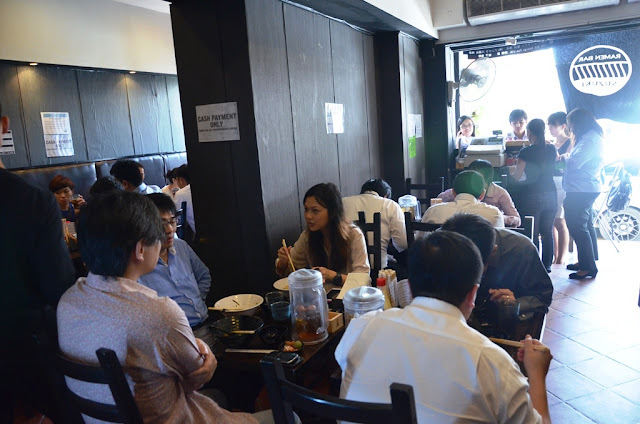 By 12.30pm, the eatery was packed busy and full of customers with the main bulk of its clientèle from the offices around the Raffles Place area. After seeking permission from the serving staff, I got myself shutter busy, oblivious of the ongoing buzz within the restaurant. Many argue that it is hard to find value for money yet calories worthy food around the Raffles Place area. 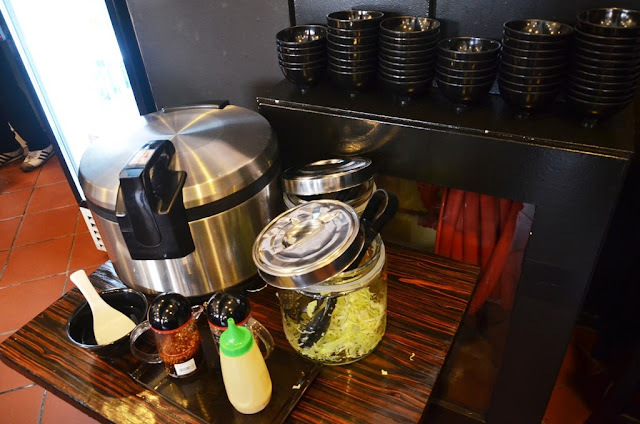 With free flow of sides such as bean sprouts, sliced lettuce, hard boiled eggs and even white rice, could this just be it? It was rather disappointing though that despite waiting for some 10-15 minutes, the empty jar of bean sprouts remained the state it was. I was half expecting it to be filled having heard about how crunchy and addictive it can be. On a fairer note, I succumbed to picking up the few miserable strands left in the glass jar. Given that it was free and offered free-flow, I should not be asking for more, but on this occasion, I actually wanted to ask for more, literally. It was crunchy and fresh, despite being soaked in a sesame based gravy. For that extra kick of fragrance, you could get it from the range of little plastic containers readily available on the tables, which even have garlic flakes for that added oomph! Just mind the burp, excuse me. Do not forget your free flow of iced tea to soothe that heat. 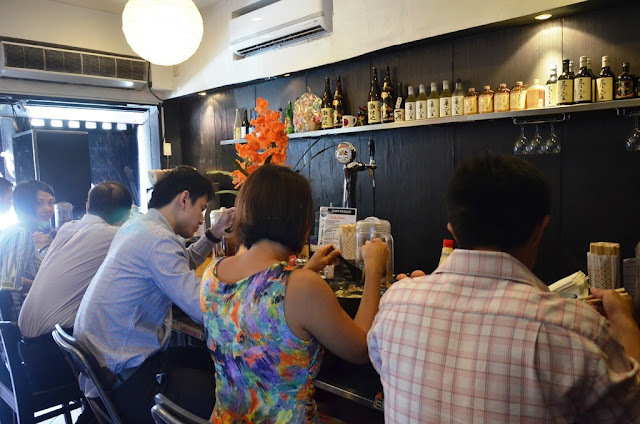 There is a mantra here at Ramen Bar Suzuki that details how best to enjoy your bowl of ramen. 1) Taste one spoon of the soup. 2) Eat the noodles fast before it becomes soggy. 3) Grind the sesame into the ramen for extra fragrance. 4) Want intensity and added richness? Sprinkle some garlic chips into the broth. 5) Toss in some petite pieces of fried pork if you ain't a weight watcher. I usually like my noodles a little on the hard side for that al dente touch and texture and this was served just to my liking. The char siew was tender and uniformly sliced to a fine thickness. Serving size was decent even for a guy and the takeaway was that beautiful broth. It was rich and certainly brought out the essence out of that pork bone. While it might not be the easiest task to draw comparison when it comes to broths, I found the one at Ichiran just a notch superior in terms of depth of flavours. Do not be mistaken. The broth was brilliant but having tried one of the best ramens in Hong Kong and arguably Japan since it was a franchise from Japan, my benchmark of a good rendition is certainly at a high level. This somewhat lacked just that extra bit of oomph to make me swoon all over. My dining companion had about the same with the additional toppings. I was disappointed with the egg which was supposed to at least have a semi-runny egg yolk but it seemed not too different from the hard-boiled eggs. 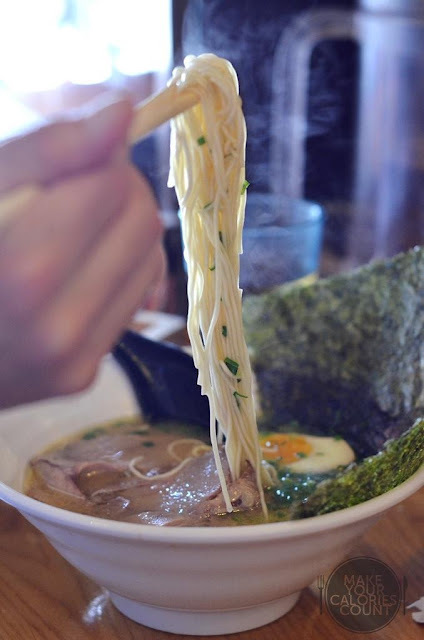 The sliced lettuce and remnants of beansprouts actually complemented the ramen beautifully adding an extra layer of crunchy texture to it. Oh well, do I hear five-a-day? Apparently a few of my colleagues are regular patrons and provided an interesting feedback which I would love to put to a test one day. The noodles provided during lunch time is typically less than that served for dinner for they believe that one should consume less in the day and a relatively larger serving in the evening. This might somewhat make carb sense because they do not serve the free flow rice during dinners. 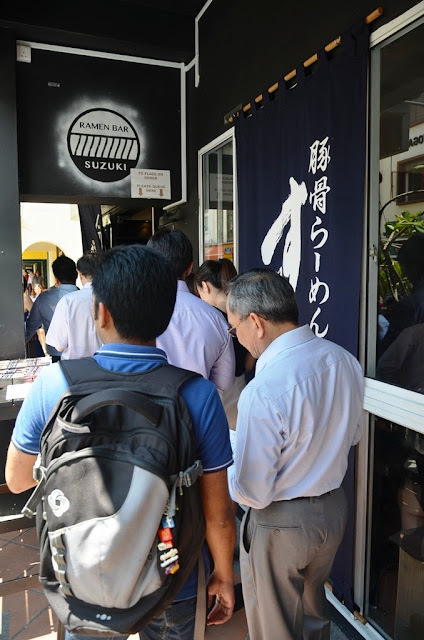 For those working around the area, you would be familiar with the queue at Ramen Bar Suzuki by now, so if you fancy your bowl of ramen, do try to head there by 12pm to beat the queue and the overbearing afternoon Sun of course. Quite frankly, I do not think there is much ambiance to speak of. Expect to share tables with strangers (or at least sit awfully close) if you are dining solo or as a couple and I would not really desire to stay long after my meal (at least in the afternoon). On the service, I thought that the waiting staffs were polite and attentive. 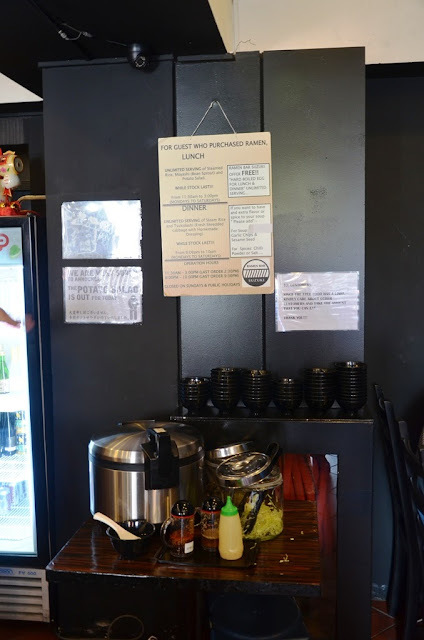 Please note that they only accept CASH, so remember to head down to the nearest ATM machine before joining the queue for your bowl of Tonkotsu ramen! 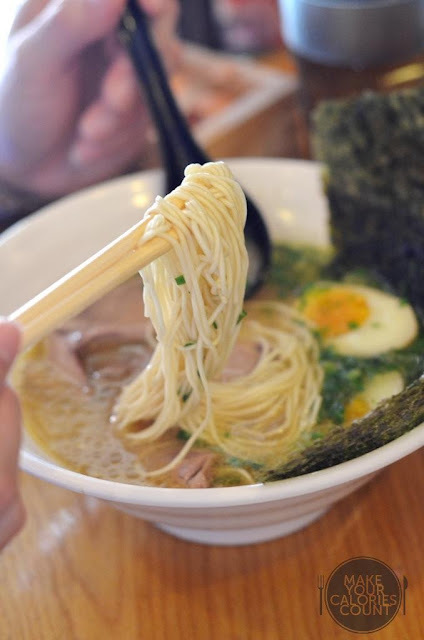 Also, the standard practice is to submit your order chit to the receptionist, make your payment then get your table and last your ramen, in that order too. Personally, I consider the price affordable and matched by a quality broth and ramen. I have my reserves on the toppings and free sides but that was partly due to the fact that they were either not quite up to standard or were not available. Having learnt that titbit on the varied portion size for dinners, I am now quite tempted to bring my lady next to give it a round two test. 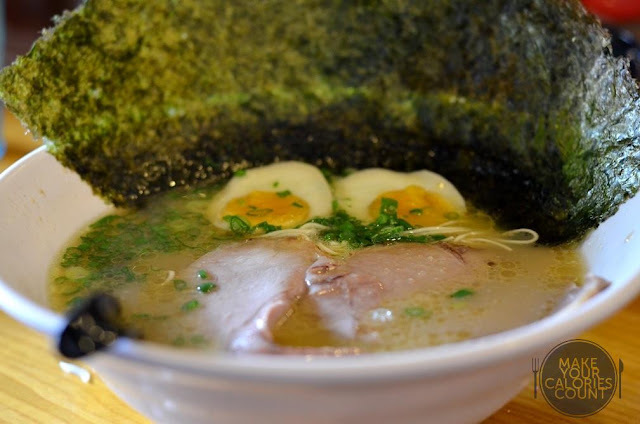 Have we found the best ramen in town? Hmm..let us come back to this after trying a few other top picks! Stay tuned for our reviews!